Below are the proper prayers for the Fourteenth Sunday after Pentecost. 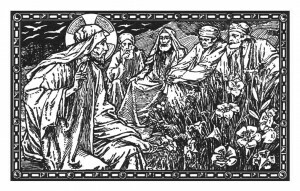 A PDF version can be found here: Proper Prayers for the Fourteenth Sunday after Pentecost. FAVOR Thy Church unceasingly, O Lord, we beseech Thee, and keep her safe: and because apart from Thee frail man is wont to fall, may she by Thy help be ever withdrawn from harm and guided in good. Through our Lord Jesus Christ, Thy Son, Who liveth and reigneth with Thee in the unity of the Holy Ghost, God, world without end. EPISTLE From the Letter of Blessed Paul the Apostle to the Galatians, 5. 16-24. BRETHREN: Walk in the spirit, and you shall not fulfill the lusts of the flesh: for the flesh lusteth against the spirit, and the spirit against the flesh; for these are contrary one to another; so that you do not the things that you would. But if you are led by the spirit, you are not under the law. Now the works of the flesh are manifest; which are fornication, uncleanness, immodesty, luxury, idolatry, witchcrafts, enmities, contentions, emulations, wraths, quarrels, dissensions, sects, envies, murders, drunkenness, revellings, and such like; of the which I foretell you, as I have foretold to you, that they who do such things shall not obtain the Kingdom of God. But the fruit of the Spirit is, charity, joy, peace, patience, benignity, goodness, longanimity, mildness, faith, modesty, continency, chastity. Against such there is no law. And they that are Christ’s have crucified their flesh with the vices and concupiscences. IT is good to confide in the Lord, rather than to have confidence in man. It is good to trust in the Lord, rather than to trust in princes. Alleluia, alleluia. (Ps. 94. 1.) Come, let us praise the Lord with joy; let us joyfully sing to God our Savior. Alleluia. GOSPEL Continuation of the holy Gospel according to St. Matthew, 6. 24-33. AT THAT TIME, Jesus said to His disciples: No man can serve two masters; for either he will hate the one and love the other, or he will sustain the one and despise the other. You cannot serve God and mammon. Therefore I say to you, be not solicitous for your life, what you shall eat, nor for your body, what you shall put on. Is not the life more than the meat, and the body more than the raiment? Behold the birds of the air; for they neither sow nor do they reap, nor gather into barns, and your heavenly Father feedeth them. Are you not of much more value than they? And which of you, by taking thought, can add to his stature one cubit? And for raiment why are you solicitous? Consider the lilies of the field, how they grow; they labor not, neither do they spin; but I say to you, that not even Solomon in all his glory was arrayed as one of these. Now if God so clothe the grass of the field, which is today, and tomorrow is cast into the oven, how much more you, O ye of little faith! Be not solicitous therefore saying: What shall we eat, or what shall we drink, or wherewith shall we be clothed? for after all these things do the heathens seek. For your Father knoweth that you have need of all these things. Seek ye therefore first the Kingdom of God, and His justice; and all these things shall be added unto you. IT is truly meet and just, right and for our salvation, that we should at all times and in all places give thanks to Thee, holy Lord, Father almighty, eternal God: Who, together with Thine only-begotten Son and the Holy Ghost, art one God, one Lord: not in the Oneness of a single Person, but in the Trinity of one Substance. For what by Thy revelation we believe of Thy glory, the same do we believe of Thy Son, the same of the Holy Ghost, without difference or separation; so that in confessing the true and eternal Godhead, in It we should adore distinction in Persons, unity in Essence, and equality in Majesty: in praise of which Angels and Archangels, Cherubim also and Seraphim, day by day exclaim, without end and with one voice, saying: — Sanctus. SEEK ye first the Kingdom of God: and all things shall be added unto you, saith the Lord.